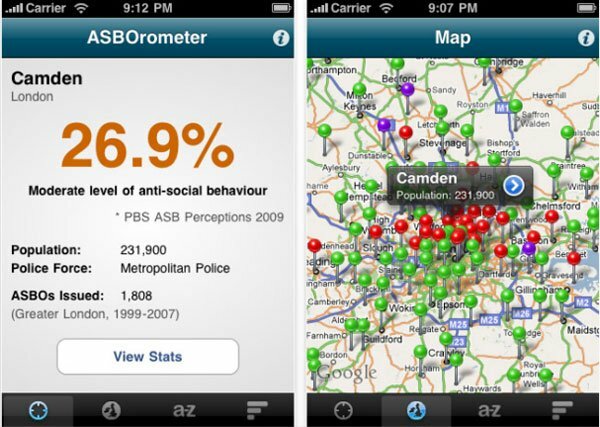 With the number of different iPhone applications available in the Apple App store, there is pretty much an application for everything, now a UK company has released a new application for the iPhone and iPod Touch that tells you how many people have an ASBO (Anti Social Behaviour Order) in a particular area in the UK. The Application on works in England and Wales, and it displays a map of how many people within that are have an ASBO. The application has been described as ‘the estate agents worst nightmare’ as it could potentially tell people which areas to avoid buying a new house in. The Application takes its information from Government databases and you put your postcode into the application and it will display the data for your area. The applications developer, Jeff Gilfelt said that ‘Although its name is fun, it has a serious message’ it is available as a free download from iTunes (UK only), and would be fun to use to see how many ASBO’s are in your area.